A few years ago my friend, Sarah and I backpacked into Lake Garibaldi, spent the night and the next day hiked the Panorama Ridge Trail. That’s the civilized way to hike it. The Panorama Ridge Trail is 6.5 kilometres one way from Garibaldi Lake – and the lake itself is 9 kilometres one way from the parking lot. It’s possible to do it as a long day hike though in total you’d have to hike 31 kilometres and climb over 1,500 metres. 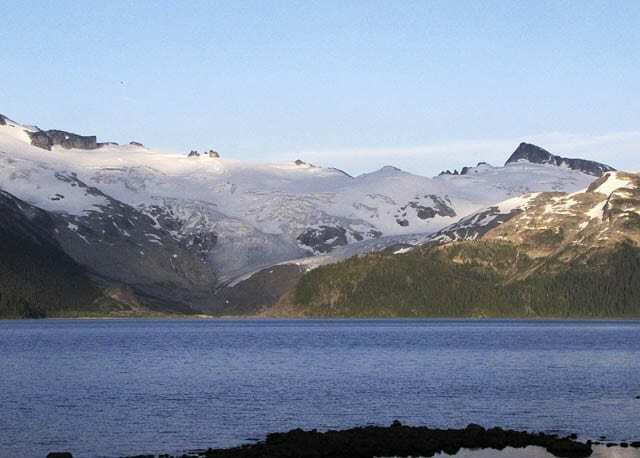 Both Garibaldi Lake and Panorama Ridge are worth taking the time to explore and enjoy. The route up to Garibaldi Lake is less than inspiring. It’s a slog for most of the way as you switchback up the mountain but the reward is the awe inspiring scenery around the lake. I can only imagine how magical the place would be without another soul in sight. The route from Garibaldi Lake to Panorama Ridge is very straightforward. Turn north at the fork at Garibaldi Lake, cross a bridge and head up into the forest. Fortunately that section is short and in no time you’re in the meadows – flower filled if the season is right and you get wonderful views of the Black Tusk. When the trail reaches the intersection in the sign noted below turn right and head down through heather filled meadows. Then begin the climb up to the ridge. In no time you’re on rocky slopes with the odd patch of snow around. Continue on the windswept ridge and follow the cairns to the top of the first ridge. The rock is loose as you head for the second ridge but it’s a short distance away. The views from the Panorama Ridge are exactly that – panoramic in scope. Enjoy your time on top. Getting to the Garibaldi Lake Trailhead Turn right off of Highway 99 if you’re heading north. The trail is signed for the Black Tusk Recreation area. It’s a only a few kilometers to the parking lot on a good road. Bring $5 bills as you must pay for parking. If you’re going to camp it’s $10 per person per night. Fees can be paid ahead of time. The scenery really is awe inspiring. I love that picture of the Black Tusk — easy to see how it got its name. Nice hike! @Cathy We were lucky with the weather that weekend too,. It is truly gorgeous though I don’t think these photos do justice to the area. @Michael Hard to miss that big hunk of black rock. I love the way it towers over everything. Wow, what an incredible beautiful place. I’d want to hike here everyday — like the way you and your friend did it. Your photos are stunning, Leigh! @Marcia Thank you – it really was a divine hike. @Mette Garibaldi Park is a huge provincial park in the vicinity of the town of Whistler. Beautiful photos and I love the one of the marmot! I haven’t even heard of Garibaldi Provincial Park, but it looks like a great place to hike. @Laurel If you ever get to Vancouver and you want a day hike that’s truly beautiful with alpine scenery then it’s a good bet you’ll head for Garibaldi. It boasts breathtaking scenery and the only reason I would choose other hikes is that I couldn’t take my dog. Wow this looks stunning and that’s the best marmot photo I’ve ever seen – I’ve always found it difficult to ‘catch’ them, in the Pyrenees and in Kyrgyzstan. @Natasha That’s a very kind comment. I’ll be on the lookout for more of them this summer. I especially like the capture of you in the wild prairie of flowers and the cute marmot on the rock. Really tempting to try trekking like this again and discover such remarkable shots. @Jesse Everyone seems to like the marmot. This one had a lot to say too. Wow it does live up to its name. Such stunning views. I’ve never been or heard of it but would love to go. That marmot is too adorable. @Bob When you get closer to the time let me know and I will give you specifics. @Mary They were wonderful views and the hiking in the alpine region above Whistler is all fabulous. Those are stunning photos. I would love hike there.